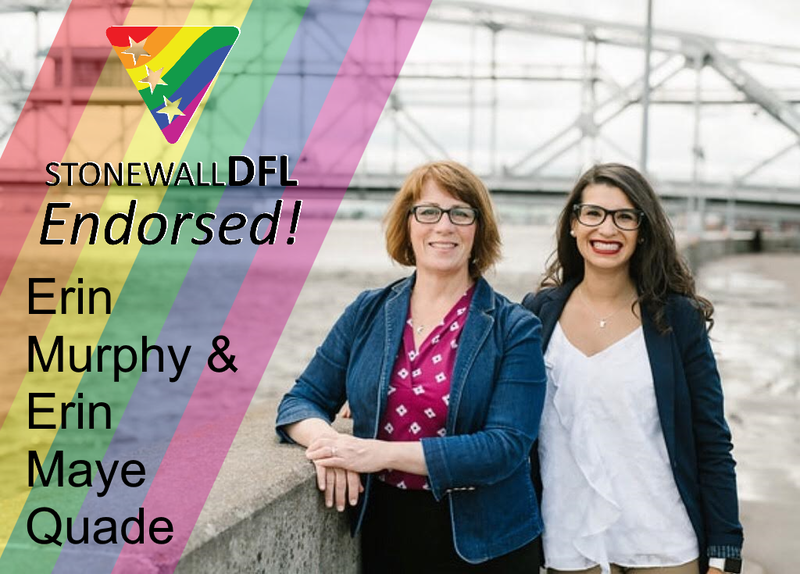 Minneapolis, Minn., June 22, 2018 – The Stonewall DFL Caucus of Minnesota announced its endorsement of Erin Murphy for Governor and Erin Maye Quade for Lieutenant Governor. The Governor is the chief executive of the state of Minnesota, leading the state's executive branch. The Governor sets the state’s policy agenda, appoints commissioners to lead the state’s departments, leads the National Guard, and makes judicial appointments. The Lieutenant Governor of the State of Minnesota is the second ranking officer of the executive branch and the first officer in line to succeed the Governor of Minnesota. “We are honored to receive the Stonewall DFL endorsement,” said Murphy. “I’m proud of our work together to pass marriage equality and anti-bullying legislation, but there is still more work to be done. No Minnesotan should feel unsafe or discriminated against because of who they love or how they identify. Rep. Maye Quade and I will stand with our LGBTQ community to make sure everyone feels welcome in our state."